Well, as it turned out it’s not difficult – just a little time consuming – at least to do it properly. In my opinion the first thing you have to get right is the pastry. You want pie pastry to be crispy both on the top and on the bottom. Then there’s the filling. What sort of quality meat should I buy? How should I cook it? How thick should the sauce be? I consulted a few recipe books and combined a few recipes – some more complex ones with some more simple – and came up with something that I reckon was pretty damn tasty. If I’d had the foresight I should have made a dozen and frozen them. I didn’t. Damn. 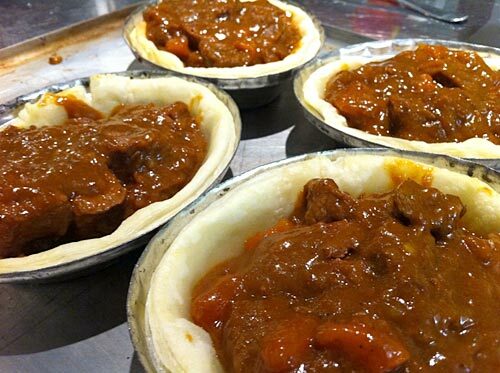 Here’s my version of the classic meat pie (beef) made in individual pie dishes for single servings. This recipe makes four pies. Dust the diced steak in flour making sure all surfaces are covered. Take a heavy bottom saucepan or frypan. Fry the meat in the olive oil until brown – around 6 minutes or so. Remove the meat and set aside. In the same pan stir-fry the onion and carrot in a little more olive oil. If you need to splash in a bit of red wine or port to deglaze the pan and mix all the juice from the meat through the vegetables. Fry until the onion begins to colour. Return the meat to the pan. Pour in the beef stock. Season with salt and freshly ground black pepper. Simmer gently on a low heat for around one hour. Once you have simmered this for an hour or longer you need to thicken the liquid. Turn the heat up and reduce the liquid by half. 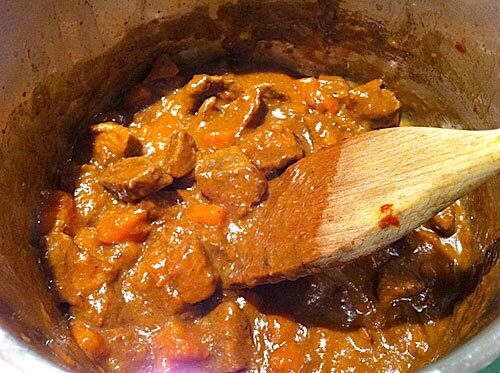 This will naturally thicken the sauce but if you can’t get it thick enough use a little cornflour, mixed well in a few tablespoons of water, to thicken the sauce. Add a couple of tablespoons of tomato paste for extra flavouring. Set the meat mixture aside to cool. I used Edmonds Flaky Pastry sheets. They are very simple to use. The best method, and this is what takes the time, is to blind bake the pastry bases. Preheat your oven to 200 degrees Celcius. Roll out the pastry with a little flour until quite thin. Grease each of your pie tins with butter. Don’t skimp! There’s nothing worse than a pie stuck in the tin. Lay the pie tin upside down carefully on the pastry and cut around the tin leaving about 2 cm of pastry showing. Turn the tin and the pastry over and gently guide the pastry down into the tin. Trim excess pastry off. To blind bake the pastry take a piece of baking paper (for each tin) and place inside the pastry, which is now in the tin. Fill it with rice, or dried beans. The purpose is to weight the pastry down and stop it rising so that there is somewhere to put the meat filling! Place the tins on a baking tray and bake in the oven for around 8-10 minutes. Don’t over cook the pastry as they’ll need to go back into the oven to be cooked again when they are filled. Really, you want the pastry slightly undercooked. Discard the rice/beans. You can keep these and use them again for more blind baking at a later date. Let the pastry cool down. Once the meat and the pastry is cool you can begin to put the pies together. Spoon the meat mixture into the pastry cases. Roll out some more pastry for the pie lids and place over the pie dish. Trim the edge and push the edges gently into the cooked pastry. You won’t get a great seal, and nor should you try – the lid, once cooked, will bind with the already cooked base. Pop the pie tins back on a baking tray and back into the oven. Cook for around 15 minutes or until nicely browned. Serve with minted peas, and the obligatory mashed potatoes. And don’t forget the tomato sauce. Time consuming the first time you do this, but I reckon with a bit of forward planning you could do this quickly and easily, and at the same time impress members of your family – especially the kids. 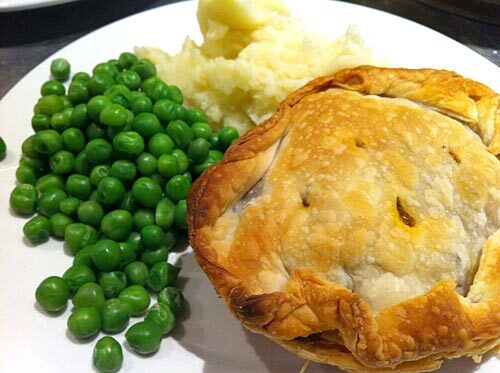 The finished product – a Meateaters steak pie! Best pie in New Zealand? I don’t care about this, now i’m earning around $5000 a month. I’m about to try your recipe, looks delicious. One question: I didn’t see a use for the corn flour in your directions. Where does it go?